Commercial Ice Machines suitable for: bars, restaurants, coffee shops, pubs and more. Our Compact Ice Cube Machine caters for all drinks needs, with different capacity/production per 24H cycle, and are either water or air cooled. Simag SMN 35 The Simag range of ice machines are designed and manufactured in Italy with continued innovation and excellent quality control. Simple and reliable, SIMAG products represent the best ratio of quality to convenience on the market. The SIMAG range has a model for every need including bars, restaurants, hotels, hospitals and food and chemical production processes. A simple water and electrical connection is all you need to have a high-quality ice production. These ice makers produce a compact, crystalline and long-lasting ice that is melting slowly, without diluting the drinks. Features: COMPACT ICE CUBE Water Spray System • Stainless steel bodywork - scotch brite • Air cooled or water cooled on demand • Vertical pump • Main switch (ON/OFF) • Built-in cleaning system • Easily accessible components • Low power and water consumption • Optimum ratio between ice production and bin capacity • Reduced dimensions • Double defrosting system • Refrigerant R134a Size (H x W x D): 810mm x575mm x485mm 24 Hour Ice Production - 10°C/10° C Air Cooled 31 kg No. of cubes 3440 Water Cooled 31 kg No. of cubes 3440 Bin Capacity 17 kg Voltage 230/50/1 standard version 220-240/60/1 on demand Warranty 3 years warranty on components ..
Simag SCN 45 The Simag range of ice machines are designed and manufactured in Italy with continued innovation and excellent quality control. Simple and reliable, SIMAG products represent the best ratio of quality to convenience on the market. The SIMAG range has a model for every need including bars, restaurants, hotels, hospitals and food and chemical production processes. A simple water and electrical connection is all you need to have a high-quality ice production.These ice makers produce a compact, crystalline and long-lasting ice that is melting slowly, without diluting the drinks. Features:COMPACT ICE CUBESPRAY SYSTEM• Stainless steel bodywork - scotch brite• Air cooled or water cooled on demand• Vertical pump• Main switch (ON/OFF)• Built-in cleaning system47• Easily accessible components• Low power and water consumption• Optimum ratio between ice production and bin capacity• Reduced dimensions• Double defrosting system• Refrigerant R134a Size (H x W x D): 905mm x485mm x575mm24 Hour Ice Production - 10°C/10° CAir Cooled 42 kg No. of cubes 2100Water Cooled 46 kg No. of cubes 2300 On Demand Bin Capacity20kg Voltage230/50/1 standard version 220-240/60/1 on demand Warranty 3 years warranty on components..
Simag SMN 45 The Simag range of ice machines are designed and manufactured in Italy with continued innovation and excellent quality control. Simple and reliable, SIMAG products represent the best ratio of quality to convenience on the market. The SIMAG range has a model for every need including bars, restaurants, hotels, hospitals and food and chemical production processes. A simple water and electrical connection is all you need to have a high-quality ice production.These ice makers produce a compact, crystalline and long-lasting ice that is melting slowly, without diluting the drinks. Features:COMPACT ICE CUBEWater Spray System• Stainless steel bodywork - scotch brite• Air cooled or water cooled on demand• Vertical pump• Main switch (ON/OFF)• Built-in cleaning system• Easily accessible components• Low power and water consumption• Optimum ratio between ice production and bin capacity• Reduced dimensions• Double defrosting system• Refrigerant R134a Size (H x W x D): 905mm x575mm x485mm24 Hour Ice Production - 10°C/10° CAir Cooled 37 kg No. of cubes 4100Water Cooled 40 kg No. of cubes 4410 Bin Capacity20 kg Voltage230/50/1 standard version 220-240/60/1 on demand Warranty 3 years warranty on components..
Simag SCN 75 The Simag range of ice machines are designed and manufactured in Italy with continued innovation and excellent quality control. Simple and reliable, SIMAG products represent the best ratio of quality to convenience on the market. The SIMAG range has a model for every need including bars, restaurants, hotels, hospitals and food and chemical production processes. A simple water and electrical connection is all you need to have a high-quality ice production.These ice makers produce a compact, crystalline and long-lasting ice that is melting slowly, without diluting the drinks. 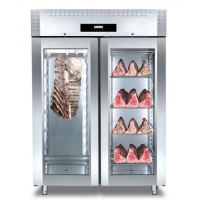 Features:COMPACT ICE CUBE-SPRAY SYSTEM• Stainless steel bodywork - scotch brite• Air cooled or water cooled on demand• Vertical pump• Main switch (ON/OFF)• Built-in cleaning system47• Easily accessible components• Low power and water consumption• Optimum ratio between ice production and bin capacity• Reduced dimensions• Double defrosting system• Refrigerant R134a Size (H x W x D): 981mm x595mm x670mm24 Hour Ice Production - 10°C/10° CAir Cooled 65 kg No. of cubes 2100Water Cooled 68 kg No. of cubes 2300 On Demand Bin Capacity33 kg Voltage230/50/1 standard version 220-240/60/1 on demand Warranty 3 years warranty on components..
Simag SMN 75 The Simag range of ice machines are designed and manufactured in Italy with continued innovation and excellent quality control. Simple and reliable, SIMAG products represent the best ratio of quality to convenience on the market. The SIMAG range has a model for every need including bars, restaurants, hotels, hospitals and food and chemical production processes. A simple water and electrical connection is all you need to have a high-quality ice production.These ice makers produce a compact, crystalline and long-lasting ice that is melting slowly, without diluting the drinks. Features:COMPACT ICE CUBEWater Spray System• Stainless steel bodywork - scotch brite• Air cooled or water cooled on demand• Vertical pump• Main switch (ON/OFF)• Built-in cleaning system• Easily accessible components• Low power and water consumption• Optimum ratio between ice production and bin capacity• Reduced dimensions• Double defrosting system• Refrigerant R134a Size (H x W x D): 981mm x670mm x595mm24 Hour Ice Production - 10°C/10° CAir Cooled 59 kg No. of cubes 6555Water Cooled 68 kg No. of cubes 7555 on demand Bin Capacity30 kg Voltage230/50/1 standard version 220-240/60/1 on demand Warranty 3 years warranty on components..
Simag SCN 125 The Simag range of ice machines are designed and manufactured in Italy with continued innovation and excellent quality control. Simple and reliable, SIMAG products represent the best ratio of quality to convenience on the market. The SIMAG range has a model for every need including bars, restaurants, hotels, hospitals and food and chemical production processes. A simple water and electrical connection is all you need to have a high-quality ice production.These ice makers produce a compact, crystalline and long-lasting ice that is melting slowly, without diluting the drinks. Features:COMPACT ICE CUBE-SPRAY SYSTEM• Stainless steel bodywork - scotch brite• Air cooled or water cooled on demand• Vertical pump• Main switch (ON/OFF)• Built-in cleaning system47• Easily accessible components• Low power and water consumption• Optimum ratio between ice production and bin capacity• Reduced dimensions• Double defrosting system• Refrigerant R134a Size (H x W x D): 982mm x575mm x1042mm24 Hour Ice Production - 10°C/10° CAir Cooled 135 kg No. of cubes 2100Water Cooled 137 kg No. of cubes 2300 On Demand Bin Capacity50 kg Voltage230/50/1 standard version 220-240/60/1 on demand Warranty 3 years warranty on components..
Simag SMN 125 The Simag range of ice machines are designed and manufactured in Italy with continued innovation and excellent quality control. Simple and reliable, SIMAG products represent the best ratio of quality to convenience on the market. The SIMAG range has a model for every need including bars, restaurants, hotels, hospitals and food and chemical production processes. A simple water and electrical connection is all you need to have a high-quality ice production.These ice makers produce a compact, crystalline and long-lasting ice that is melting slowly, without diluting the drinks. Features:COMPACT ICE CUBEWater Spray System• Stainless steel bodywork - scotch brite• Air cooled or water cooled on demand• Vertical pump• Main switch (ON/OFF)• Built-in cleaning system• Easily accessible components• Low power and water consumption• Optimum ratio between ice production and bin capacity• Reduced dimensions• Double defrosting system• Refrigerant R134a Size (H x W x D): 981mm x670mm x595mm24 Hour Ice Production - 10°C/10° CAir Cooled 59 kg No. of cubes 6555Water Cooled 68 kg No. of cubes 7555 Bin Capacity30 kg Voltage230/50/1 standard version 220-240/60/1 on demand Warranty3 years warranty on components ..
Simag SCN 215 The Simag range of ice machines are designed and manufactured in Italy with continued innovation and excellent quality control. Simple and reliable, SIMAG products represent the best ratio of quality to convenience on the market. The SIMAG range has a model for every need including bars, restaurants, hotels, hospitals and food and chemical production processes. A simple water and electrical connection is all you need to have a high-quality ice production.These ice makers produce a compact, crystalline and long-lasting ice that is melting slowly, without diluting the drinks. Features:COMPACT ICE CUBEWater Spray System• Stainless steel bodywork - scotch brite• Air cooled or water cooled on demand• Vertical pump• Main switch (ON/OFF)• Built-in cleaning system• Easily accessible components• Low power and water consumption• Optimum ratio between ice production and bin capacity• Reduced dimensions• Double defrosting system• Refrigerant R134a Size (H x W x D): 1132mm x575mm x1042mm24 Hour Ice Production - 10°C/10° CAir Cooled 160 kg No. of cubes 8000 Bin Capacity68 kg Voltage230/50/1 standard version 220-240/60/1 on demand Warranty 3 years warranty on components..